ProFauna Bali Representative conducts monthly monitoring on the wildlife traded in Satria bird (animal) market in Denpasar, Bali. Satria market is the largest animal market in the island. 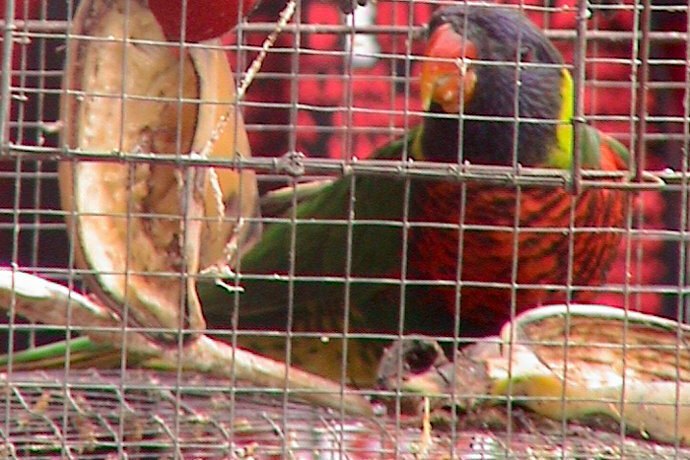 For previous months, the parrot trade was small. Surprisingly, the result of the monitoring in January 2012 showed that there were 35 parrots traded in the market, including the Moluccan parrot, the Red Lory (Eos bornea) and the Rainbow Lorikeet (Trichoglossus haematodus). The traded parrots were sold from 600,000 Indonesia Rupiah (60 USD, 1 USD = 10,000 IDR) to 1.5 millions IDR. One of the traders admitted that he imported the parrots from the neighboring islands of Bali: Lombok and Nusa Tenggara Barat (West Nusa Tenggara). Parrots are favorite bird species in the market. The trader added that less than two weeks after the shipment, the birds are sold out easily. Even though the red lory and the rainbow lorikeet are not yet protected by the Indonesian wildlife law, the high trade of the parrots in Bali should be a warning for wildlife conservation. 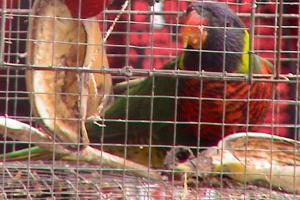 Furthermore, one of the traders confessed that he sometimes sold protected parrots. Therefore, ProFauna will keep continuing the monitoring in the market.